Episode 224 – Why a New Translation of the Mass? These topics are part of his regular podcast and if you are in a hurry, the topic usually begins about 20-24 minutes into the show. If you want a more in depth look at the changes coming I HIGHLY recommend Fr. Bill Holtzinger’s Mysteries of the Mass podcast. 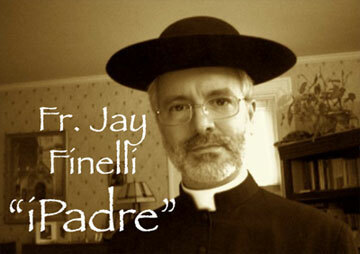 He has three absolutely excellent podcasts featuring a talk by one of the lead translators, Fr. 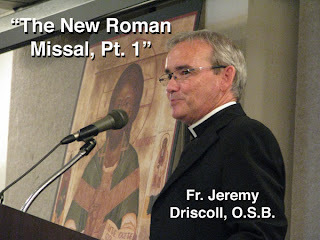 Jeremy Driscoll, O.S.B. I urge you to listen to the podcasts entitled The New Roman Missal Parts 1, 2 and 3. They are episodes 10-12. You can get them at iTunes or listen on the web. Fr. Driscoll only gave this talk at this conference, and his insights are invaluable at understanding why a translation was needed, Mass translation in general, and how they went about correcting the current translation. I cannot urge you highly enough to listen during your commute or workout. I was fascinated. As the time gets closer for us to start using the new translation, I’ll put up what I find that will help get you ready. I’m looking forward to seeing what new missals will be coming out, and what aids will be released to help us. I found this just yesterday. It is the Magnificat Roman Missal Companion. It is very modestly priced at $3.95. At this point, I think I will subscribe to the Magnificat this year, before I choose a permanent missal. It is beautiful monthly publication that is part missal, part daily prayer and meditation aid. You can order a complimentary copy to try it for yourself. I know many friends and clergy who love it.